Identify the first sounds in words. Users see and hear the word before attempting to pick the starting sound using the keyboard. Pressing the keyboard allows the user to hear the letters and digraphs. Choose from 56 words, starting with vowels, consonants and the digraphs “ch”, “th” and “sh”. Identify the first sounds in words. 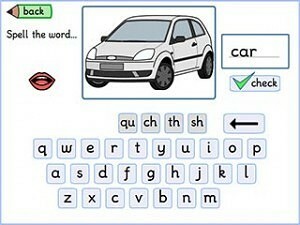 Users see and hear the word before attempting to pick the starting sound using the keyboard. 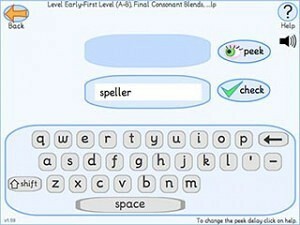 Pressing the keyboard allows the user to hear the letters and diagraphs. Choose from 56 words, starting with vowels, consonants and the digraphs “ch”, “th” and “sh”. Practise spelling short words containing blends, such as ‘br’ and digraphs, such as ‘ai’. 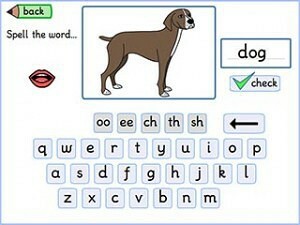 There are 60 words to choose from, each with its own image and speech support. On-screen keyboard and scanning options are available. Practise spelling using the well proven method, “Look, Say, Cover, Write and Check”. Users enter text using their keyboard or the on-screen keyboard. The word database includes lists graded from Early Level to Second Level of the Scottish Curriculum for Excellence and additional lists organised by topic.